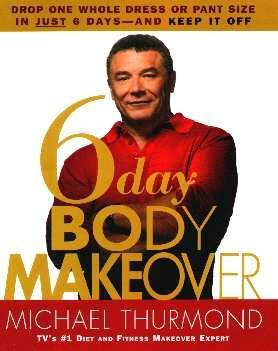 Michael Thurmond is instantly recognizable because of his appearance on "Extreme Makeover" where he guides participants, through diet and exercise, getting them into shape. He appears, sometimes, to be a bear with a sore head and yet, he pushes on regardless. Let me start by telling you what it says at the beginning of the book: "The dietary advice contained in this book is designed to be used for six days, and not as a long-term diet". Thurmond's introduction, if you read it quickly, sounds like an infomercial with the words "six day/s" repeated some 37 times over 10 pages. Now, it's common knowledge that the longer it takes to lose weight, the longer it stays off - I've proved it. Rapid diets are not the answer. However, according to Mr. Thurmond, his book "...is a comprehensive program that includes targeted body-sculpting routines that you can follow if you need to lose more weight". And, he says, "...you must eat frequently in order to speed up your metabolism to the point that it burns calories faster". Also, "If you cut out the carbs, at some point your body will go into what is known as a catabolic state - it begins consuming its own muscle tissue for energy", and "Brain cells need glucose from the breakdown of carbs to function". Personally, the thought of giving up carbs is terrifying. Back to the book - firstly, you have to find your own blueprint through a questionnaire and illustrations and then find the foods suitable for your body type. Everyone has been waiting for this kind of "diet" and Thurmond swears by it. I want to try it out but until I am fully employed, I cannot afford to get the foods I'll need. We know you have to change what you eat, right? So, why not do it properly and get the right foods? I can see I'll be in for a lot of tuna. As far as exercising goes, I ride by bicycle everywhere as I don't have a car. We've seen the remarkable changes in the "Extreme Makeover" participants so there's no reason this "diet" shouldn't work. Thurmond says that "Much of my program is concerned with controlling the levels of sugar and insulin in your bloodstream to keep them from telling your body to form fat". So, once you've decided on which blueprint is yours, what parts of your body need attention, and which exercises will be appropriate for your body, you next discover your new eating plan. Herein lies the true secret to losing weight - what you eat! He even covers certain medical conditions; menopause, hypoglycemia, hypertension, thyroid disease, diabetes, allergies, cholesterol, etc. There are even some recipes at the end of the book. I'm going to try lifting weights because I know I've not much strength in my arms, for one, and will benefit from at least strenghtening them up. You'll be glad to know you don't have to exercise till you drop (which is counter-productive as in many cases you are only burning sugar, not fat), so more sedate exercises is wonderful - not all of us are athletes-in-training. Tip: When reading this book, start keeping personal notes about your body in a little journal, with the relevant page numbers of the book, which will enable you to easily reference where you are in Thurmond's book. Visit Michael Thurmond's website for more information. Conclusion - Highly recommended reading if you're serious about your weight and health and want to lose weight productively.